After the anti-climax of the transfer deadline day it was back down to business with the visit of Cambridge United in the 4th round FA Cup replay. Following United’s disappointing performance in the first match it was time they stamped their authority on a tie that they should have settled first time around. For the visitors it was a no lose situation as they expected a financial windfall from their well earned replay. The Cambridge players were certainly enjoying their final as they took ‘selfies’ from inside Old Trafford before the match. Louis van Gaal showed his intent by choosing a strong line up made up of De Gea, McNair, Smalling, Evans, Rojo, Blind, Fellaini, Mata, Rooney, Di Maria and Van Persie. Interestingly van Gaal seemed to have chosen his tallest players, excluding Mata, to counter the height advantage in the opposition. Fellaini would be used up front alongside van Persie but once again there was no starting place for Ander Herrera who was joined on the bench by Valdes, Jones, Falcao, Young, Valencia and Wilson. Herrera’s omission once again sparked debates between fans as to why he had been overlooked again. The kick off was delayed for 20 minutes due to heavy traffic but when it did start it was almost a dream beginning for the lowest ranked team left in the competition. Elliott hit the outside of the post after only 1 minute following an uncharacteristic mistake in midfield by Blind who stumbled while attempting a back pass. Elliott was winning all the early balls knocked up to him as Cambridge started full of confidence and were clearly enjoying their big night out. It took United ten minutes to get into their stride and to start to make in roads into the visitors defence mainly via Di Maria from the inside left position and youngster Paddy McNair filling in as wing back on the right. Fellaini, playing in a forward position, utilised his height to great effect when balls were played up front. United got the breakthrough their play deserved after 25 minutes following good work by McNair who brought the ball out of defence then fed a fine pass to Di Maria out on the left. Di Maria in turn lofted the ball to the far post where Fellaini rose to head the ball back into the penalty area for Mata to pounce and flick the ball home. 1-0 ahead after an excellent move with Fellaini using his height to great effect. Mata almost grabbed his and United’s second but miss hit his shot which then rebounded out to McNair who fancied his chances from outside the box. He connected well with the ball but his shot was well blocked for a corner. On the half hour mark defender Marcos Rojo claimed his first goal as a United player by heading in a wonderful chip into the box by Robin van Persie after he had collected the ball from Fellaini’s attempted shot. The way van Persie dinked the ball onto Rojo’s head with the outside of his left boot was sublime. By this time Fellaini was causing all sorts of problems for the Cambridge defence with his presence inside their box. At 2-0 the tie was virtually over and it became a damage limitation exercise for the away side. However, to their credit they kept going and Donaldson had a shot across goal when he should have done better. Chris Smalling provided a rare moment of class with a superb through ball for Di Maria but as quick as the Argentinian was the keeper managed to get to the ball before him on the edge of the box. On another break forward Di Maria played a great weighted cross field ball aimed for Rooney who met it on the volley but fired well off target. Half time and so far so good from United. It was refreshing to see the team using the wide areas when on the attack, something that has been lacking in recent games. Di Maria is so much more effective out on the left, as he proved in the first 45 minutes in this match. Paddy McNair was also putting in a mature performance as the right sided wing back. At the start of the second half Rojo’s debut goal had clearly gone to his head as he ventured forward down the left and attempted two crosses which both ended up way too high and behind the goal. At least he was trying. McNair was making a better go at crossing than Rojo with one nice cross to van Persie who headed wide. The Dutch striker had a chance again after a lovely ball over the top this time from Mata, but was disappointed with his weak header. After 53 minutes Rooney had a shot well saved by keeper Dunn, as the ball spilled out van Persie just couldn’t tidy up the leftovers. The fans enjoyed seeing the tricks and flicks on show by van Persie and Di Maria, the latter trying hard to score direct from every corner he took. You got the feeling as though it was not going to be van Persie’s night and so did van Gaal who replaced him with James Wilson on 66 minutes. The striker headed straight down the tunnel, maybe he had a prior arrangement that he was desperate to get to. Two minutes later Di Maria had a powerful effort pushed over the bar by the keeper for a corner. If it wasn’t for Dunn in the visitors goal the score would have been a lot higher. That was the last action for Di Maria as in the 70th minute he was replaced by Ander Herrera. The midfielder got his chance to impress the manager, who for some reason doesn’t seem that enamoured by the Spaniard. United’s third and final goal came in the 73 minute through James Wilson with a fine left footed strike from just outside the box. A well taken goal from a player who is growing in confidence with every game. It was a shame RvP wasn’t there to see it. Another youngster who was having the match of his career playing down the right was Paddy McNair. He continually delivered some fine balls into the danger area especially to Rooney who unfortunately couldn’t take full advantage. The last change of the night for United was the substitution of Rojo for Ashley Young who came on to make his 100th appearance for the Red Devils after being out injured.There was still time in the match for Smalling to make a customary mistake and give the ball away in a dangerous area, which thankfully led to nothing. The visiting Cambridge supporters kept on singing until the end and nearly got their reward as the visitors had the last effort at the death. The match ended with a 3-0 win for the home side who in the end were too organised and purposeful and fully deserved their win with quality performances from most of the players against opposition that would not lie down. They will now face Preston in the 5th round at Deepdale. I would like to take this opportunity to wish Darren Fletcher all the best for his future after leaving United to join WBA after almost twenty years on United’s books. A true gentleman of the game and one of the most generous personalities in football. On the same day Anderson returned to his native Brazil and Fergie’s last signing Zaha rejoined Crystal Palace. The only player in was on loan defender Andy Kellett from Bolton. Before United face West Ham over the weekend it will be a time for reflection on Friday the 6th as it will be the 57th anniversary of the Munich air disaster in which our club, country and football lost the majority of a team that was on the brink of European glory, a team made up of young men who were doing something that they fully enjoyed, playing football. There can be no bigger incentive for the present team to qualify for a competition that half a century ago the pioneers gave their lives for. The Flowers of Manchester. Never forgotten. 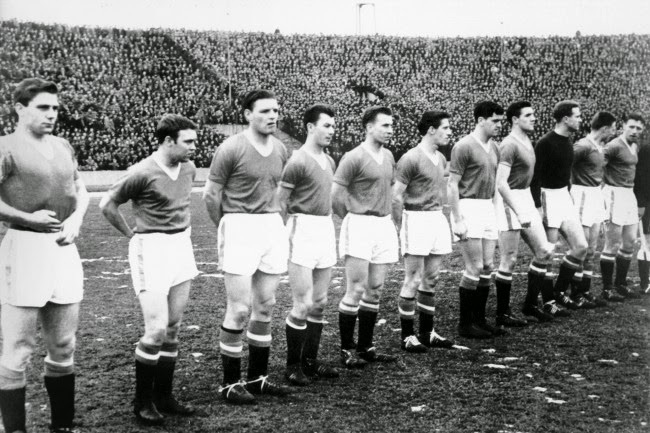 Roger Byrne, Mark Jones, Eddie Colman, Tommy Taylor, Liam Whelan, David Pegg, Geoff Bent and Duncan Edwards. Previous Man United outgun the Foxes. 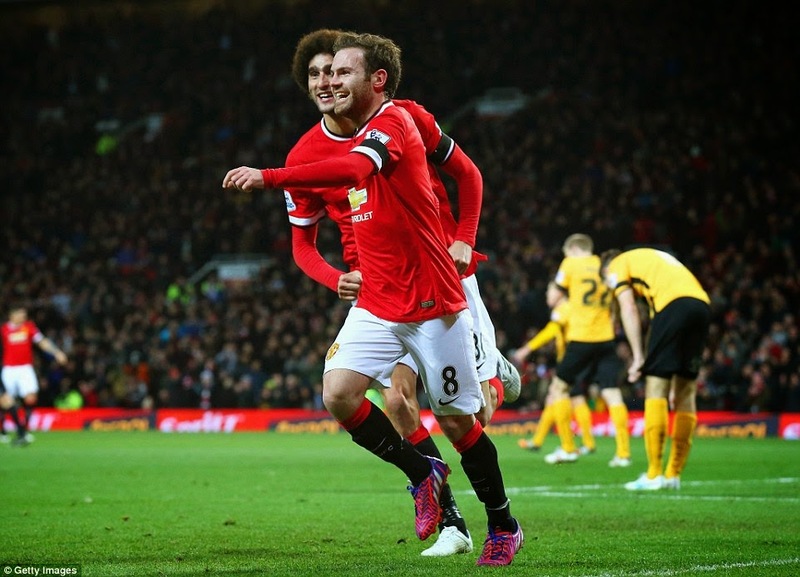 Next Blind rescues a point for United.